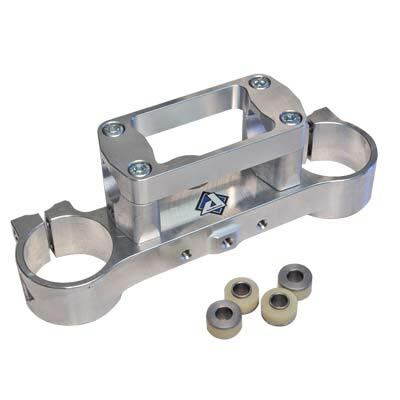 This CNC machined Factory Set, made of billet aircraft aluminum, rubber mounted, 18mm offset, provides superior strength and durability while maintaining or even reducing weight. The reversible bar mounts included in the Factory Set are available in different heights, to further tune the rider's position for a custom fit. 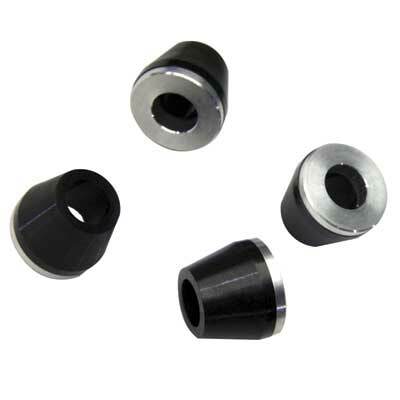 Fork holes are bored, not honed, and are precision machined for a perfect fit and greater clamping surface. The Factory Set comes complete with an upper and lower clamp, reversible bar mounts, a one-piece handlebar clamp and all the necessary hardware. Made in the USA with a lifetime warranty to the original purchaser! Rubber Cones must be purchased with set. (Cones NOT Included) (Large Fork) This will NOT fit an '03 or '05 SX, LC4 models, or any model with an adjustable steering stem.